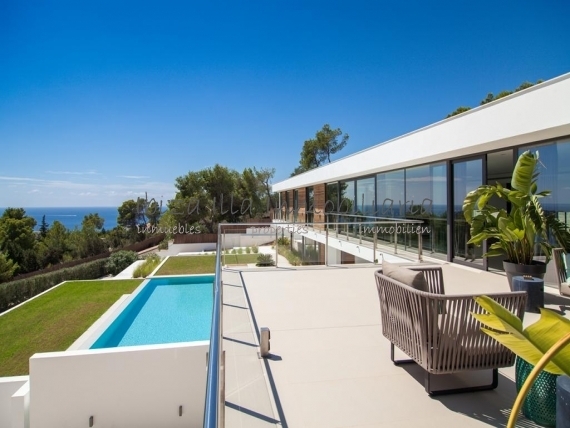 Recently built, the property offers beautiful views of the bay and the Porroig peninsula, beautifully manicured gardens with water features and privacy. The access level invites you to enter through a beautiful entrance hall that leads to the terrace and pool area or to the upper floor. This level incorporates a splendid diaphanous environment of common areas with the large living room, a professional kitchen with office and pantry, a guest cloak room, the dining room and terrace with wonderful views. There is also the master bedroom and two guest bedrooms. All bedrooms have balconies with superb views. On the pool level there is a fully equipped outdoor kitchen with covered dining area and ample lounging space around the decked pool, as well as another guest bedroom, creating a perfect environment for outdoor enjoyment. All bedrooms are decorated with exquisite taste and have comfortable bathrooms as well as terraces. In addition, an office, ample storage spaces and a double garage. The Vista Alegre urbanization is in a secure enclosure that houses luxury homes in a select environment. Its proximity to the airport and beaches of the south coast with its famous beach clubs position it in a strategic location.